Daimler Trucks North America (DTNA) has long been at the forefront of industry-leading innovations. Our legacy is defined by a track record of technological advancements, including Intelligent Powertrain Management – to save fuel on hilly terrain, Active Brake Assist – to apply full braking on stationary objects and Lane Departure Warning – to help drivers stay centered in their lanes. The quest to fulfill our mission to save fuel and lives drives our engineers to push the envelope every day. We recently introduced an exciting new chapter in our innovation story. 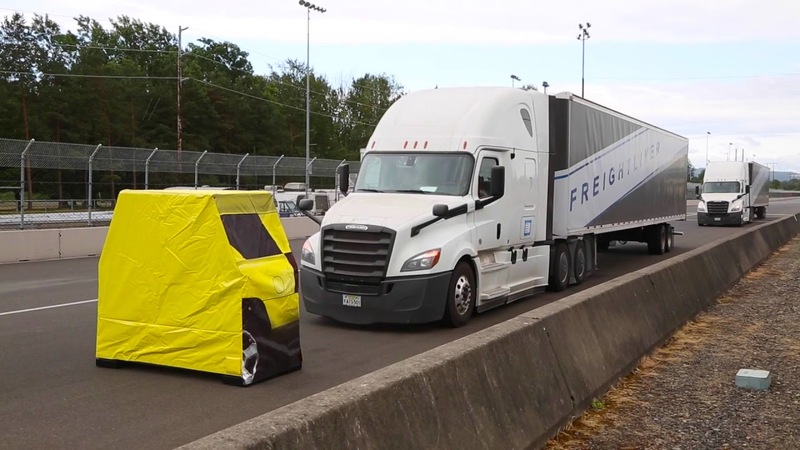 We conducted a pairing demonstration at the Portland International Raceway, featuring two tractor/trailers driving at close following distances, saving fuel by reducing aerodynamic drag. Pairing technology builds on our flagship safety package, Detroit Assurance 4.0, using the latest in active safety features, including radar and camera systems to assist the driver in braking, accelerating and steering maneuvers in coordinated fashion. The radar system can detect up to 40 objects in front of the vehicle, out to 825 feet, and can track the top six objects that pose a crash risk. The electronic controller or Video Radar Decision Unit evaluates and refreshes the radar signal 200 times per second without missing a beat. The secret that makes pairing possible is vehicle-to-vehicle (V2V) wireless communication, which enables vehicles to talk to each other over the air. They exchange information such as position, speed and braking status, at 20 millisecond intervals, to respond to each other’s maneuvers seamlessly, orders of magnitude faster than a human ever could. Safety is paramount, so an extensive development and validation program for pairing is also underway. Demonstrating the technology on the racetrack showcases key safety features under different driving maneuvers, such as coordinated emergency braking and vehicle cut-in scenarios. Witnessing it in person is truly impressive. Once rigorous testing is complete, we aim to conduct a pairing pilot with a top fleet to evaluate the technology under real-world conditions later this year. By co-creating with our customers to gather input and feedback, we not only enhance pairing itself but also understand driver acceptance to ultimately realize the full benefits of this exciting new technology. Since embarking on the journey to develop active safety nearly five years ago, the hard work and commitment of DTNA employees is paying off. Today we are proud to say that 70 percent of New Cascadia orders are equipped with Detroit Assurance 4.0! What does it mean to have the market-leading vehicle equipped with the latest active safety systems? Quite simply it means having a safer highway network with fewer accidents, injuries and fatalities for everyone on the road. We strive to ensure that our loved ones make it home safely each and every day. That’s what drives us to innovate. Leading the commercial vehicle industry in safety, technology and connectivity, at DTNA, we are privileged to live and work in very exciting times for leading-edge data integration. Making comprehensive, actionable intelligence accessible from our connected trucks is transforming the way our customers interact with them and directly impacting their businesses’ bottom lines. Technology moves fast, and this new era of e-mobility is no exception, demanding massive investments in focused knowledge, support and infrastructure. At Daimler Trucks North America, we’ve always been comfortable out front, introducing innovative new trucking technology, as exemplified by two new electric Freightliner trucks: the eCascadia and eM2 106.